CH: How did your initial desire to make the biblical wisdom of the church fathers available in the Ancient Christian Commentary on Scripture (ACCS) evolve into the mission of promoting early African Christianity? TO: Through 20 years of working on the ACCS, our editorial team saw how so much important Christian exegesis came out of Africa. 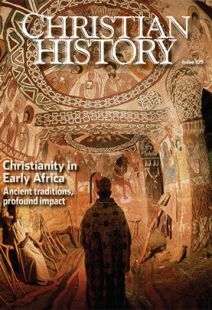 In textbooks, the earliest Christian writers in Africa are viewed as either Romans or Greeks—ideas moving down into Africa. But ideas were actually moving from Africa to the north. Why were the African layers of early exegesis so important? Why were they ignored? CH: You’ve shared this mission with people both on the African continent and here in the United States. What kind of response have you received? TO:The Africans we’ve talked with—Catholic, Coptic, Pentecostal, mainline Protestant, evangelical—have had a response of joy. In the African American audience it’s somewhat different, because of the history of colonialism in modern Africa. So we get a question we face honestly: why are white people reading about black history? We feel that classical Christian teaching about Jesus Christ and his incarnation and resurrection does not depend in any way on the color of one’s skin. We simply want to let people know how deeply African-born voices impacted world Christianity. CH: What will people read in global Christian histories of the present and future that they haven’t before, especially in the West, because of the research you’ve been doing? TO:Teaching about the Trinity was strongly formed in Africa. Now, that took formal shape at the Council of Nicaea. But the battles that enabled Athanasius to so rigorously defend orthodoxy were fought in Africa before they were fought in the north. Sabellianism, Arianism—these were contested mostly in Egypt, Libya, Proconsular Africa (northern Tunisia), Numidia, east Algeria. I have little interest in heresy except that it helps define what orthodoxy is not. Doctrinal definitions of orthodoxy emerged through a conciliar process that began in Africa. Ultimately all of the most important ecumenical decisions had the consent of all three parts of Christendom—the African cultural crossroads of Alexandria as well as Latin Rome and Greek Antioch. But Africa was first. CH: So the conciliar impulse—to gather under the leading of the Holy Spirit, to understand and interpret together—was an African impulse. TO: These processes are deeply rooted indigenously in African cultures. The great monastic centers of the middle Nile and upper Nile are a big part of that. Out of the African ethos also came a great hunger to follow the consensus of the canonical writers. The biblical canon was written all around the Mediterranean, but the canonization process took place as a result of decisions made in Africa by Athanasius and Augustine. CH: What can those who have a concern for ecumenism in the church today learn from this? TO:Ecumenism today often consists of bureaucrats deciding what meets modern criteria of acceptability. Early African ecumenists wouldn’t recognize that method at all. If a passage of Scripture seems ambiguous, you look at it in relationship to other passages. You don’t solve every problem of textual interpretation by extracting that text out of its larger context—social context, historical context, or scriptural context. We could learn from their ways of interpreting Scripture. CH: What else do you think modern American Christians need to recover? And how? TO:Don’t start with modern secondary sources. Start with primary sources. If you can read Latin, Greek, or Syriac, do that, but most people can’t, so start with English sources, well translated. Open any book and you will get the sense of a profound spirituality. If you care about the unity of the body of Christ, you’re going to care about how questions of heresy were answered. Find out what the apostolic witness from Africa says about the catholicity, the universality of the faith. The question of structural unity is crucial. Or take politics: Augustine’s City of God. When we think politically as modern people we think of the city of man. That’s not the most important city. We are citizens of a community that celebrates the grace of God in every generation, and we are called to be finally accountable to that community before God in the last judgment. American Christians today are almost totally ignorant of that communal pattern of thinking. Why don’t African Americans know more about Augustine’s political wisdom, his sense of justice, and his care for the poor? African American theology in the last few decades has, with a few exceptions, very little about patristic Christian teaching. Our project is not Afrocentric—the view that Africa is the center of all Christian knowledge. We’re talking about a universal Christian history first uncovered and explained on the African continent. CH: You mean a sense that the God story, the Christian story, is the world story? TO:Arguably Africans were among those Christians most intent upon saying, “We are citizens of a cosmopolitan community, a community that stretches all around the world.” They focused on what God was doing for the whole world in Jesus Christ and through the Holy Spirit. We have not mastered this in modern ecumenism. You can read this in prayers, in hymns, in the liturgy itself. Africa contributed deeply to the Western liturgical tradition. Monastics gave their whole time, their whole day, their whole life, their whole soul to embodying this life (see “Become completely as fire,” pp. 15–17). CH: You talk about the impulse for unity. There is also, as you pointed out, a history of significant schism. What are cautionary lessons? TO:Often territorial conflicts had a huge impact upon the separation of cultures rather than their finding a unity in Christ. The Donatist controversy was really fought out in Africa (see “See how these Christians love one another,” pp. 29–33). The Donatists never quite got it. They were willing to create separate churches in the same little towns in Algeria. There must have been a thousand of them, and they lasted for centuries. CH: What about other areas of ecclesiastical life? TO: In church leadership—courage. There’s a huge witness of people willing to risk their lives for the faith from Africa. In missions there’s Pantaneus, who taught Clement of Alexandria, who taught Origen. There is a credible tradition of him going all the way to India. There was a universal sense of mission. African Christianity also planted seeds that in the eighth and ninth centuries bore fruit in the conversion of Europe. Think of monasticism. You could never have had Benedict without Cassian and Rufinus and the people who visited the monastic movement in the Nitrian Valley and told people what they saw. CH: What other projects are you working on? TO: We are beginning a children’s biography project. We want to tell, for children, these stunning, moving stories, many of them about martyrdom, having to do with great courage in the face of huge obstacles. We are also very interested in undiscovered African texts. Archaeological data and the means of discovering texts are improving immensely. We are interested in finding new papyri that pertain to the interpretation of Scripture and make a legitimate scholarly contribution. Tom Oden is professor emeritus at Drew University, Madison, NJ, general editor of the Ancient Christian Commentary on Scripture, and director of the Center for Early African Christianity.